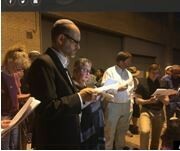 Tisha B’Av vigil at the Elizabeth Detention Center housing hundreds of immigrants. The Montclair Sanctuary Alliance is an interfaith network of congregations, organizations and individuals offering sanctuary to individuals resisting detention and deportation in order to stay together with their families and communities. We stand publicly against the injustices affecting immigrants and support reforms to promote fairness. Many of us are living lives that are the fulfillment of our parents’ and grandparents’ risks and sacrifices to come to the United States. Our freedom, prosperity, safety and in many cases our existence – came about because a previous generation took the risk in a moment of uncertainty to come here. Maybe that is why so many of us are alarmed and concerned by immigrants being threatened with deportation. A growing number of churches and synagogues are offering sanctuary to individuals fearing deportation. This works because there is a longstanding policy of Immigration and Customs Enforcement (ICE), to avoid arrests on congregational property. Sanctuary may offer an individual time to seek a deferment or other resolution that will allow them to maintain their residency. Sometimes the public attention itself seems to open up new possibilities. The Bible commands us repeatedly to protect the stranger. Montclair congregations support the Sanctuary Movement support in several ways, including advocating changes to federal and local policy. What we are doing in Montclair is actually creating a space within the Bnai Keshet building to offer physical shelter to an individual or family at risk of deportation. To this end, we need your support. Funds are needed to renovate space for a long-term guest seeking sanctuary. In addition, funds are needed to help cover costs of living (medical, food, legal, etc.) for a guest who can no longer work. We initially need to raise $10,000 to support this effort. Any surplus funds will be directed to other faith-based efforts to support the Sanctuary Movement. Please click below and give what you can. Get involved. We need volunteers to help in a variety of other ways with hosting, meal preparation, transportation, court accompaniment and advocacy; the work is ongoing. We’ll provide training as needed. Here are links to the many ways you can help. Pick one. Let us join together as a community to love and protect the stranger. A: The Sanctuary Movement began in the 1980s when U.S. faith leaders organized to protect asylum seekers fleeing violence in Latin America. Today Bnai Keshet, with partners Unitarian Universalist Congregation of Montclair, First Congregational Church, Faith in NJ and other local faith leaders’ support, will be offering a family (or individual) at risk of deportation physical shelter on BK property. We call the effort the Montclair Sanctuary Alliance (MSA). Q: What will we offer a long-term guest seeking sanctuary? A: Safety, support, and time to seek a resolution. We are renovating an apartment; please donate if you can. MSA teams are moving ahead (facilities, legal, funds, publicity, rapid response, hosting). MSA held an interfaith gathering at BK, Rededicating Our Sanctuary to SANCTUARY, in December 2017. Efforts continue – volunteers are welcome! Q: What do our traditions say about protecting the vulnerable? A: Protecting the vulnerable is the moral core of our traditions. Our faith commands: “You too must love the stranger, for you were strangers in the land of Egypt.” The Bible commands us once to love our neighbor, twice to love God, but to love or protect the stranger at least 36 times. It is about fairness and also a path to finding God. Q: Does the law protect undocumented immigrants given sanctuary? A: No, they could still be arrested. But Immigration and Customs Enforcement (ICE) has avoided arrests on congregational property. Q: We are we offering sanctuary publicly, not privately? A: To change hearts and minds. Tightening borders lets us imagine the U.S. can wall off the suffering in other places. We hope that supporting and collaborating publicly with immigrant neighbors and friends will strengthen the fabric of our society and ultimately, help change federal policy. Q: How else will we help the undocumented? A: We are forming rapid response teams--bearing witness and offering support (though not obstructing) ICE raids, and will provide accompaniment training and send volunteers to accompany those at risk of deportation to ICE check-ins and court. 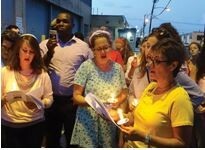 WNYC News feature, “Synagogues Show Solidarity with Detained Immigrants on Holy Day".